Check out the latest Shepard Fairey x Upper Deck collaboration of the king of hoops: Michael Jordan. Shepard is picking up where he left off last year with hisÂ Purple/GoldÂ Kobe Bryant “MVP” print. 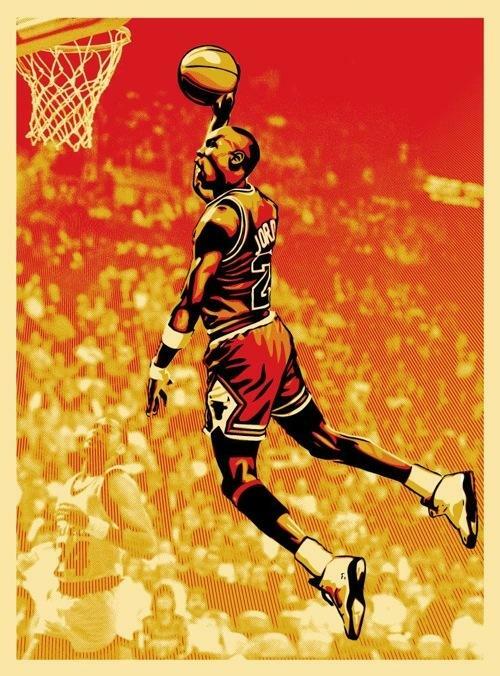 As with the Kobe x UD x Fairey print, this will most likely be released only through Upper Deck’s website and will most likely be signed by BOTH Shep and MJ. We’ll keep you posted once more info is released. What mega athlete should Upper Deck and Shepard do next? How about one of the greatest golfers ever – Tiger Woods!? Well, just wait a little longer and AM will bring you the scoop on that little project. Image via our boys at OMG posters. Categories: Art, Art products, Contemporary Art, Releases, Street & Urban Art. Tags: Contemporary Art, Michael Jordan, Releases, Shepard Fairey, Street & Urban Art, Tiger Woods, Upper Deck.